Fight for Me was one intense book! From the very first page, this book was action packed! This book was so fast paced that I blew through the book in one sitting. The author did a great job at keeping me on my toes! It was a little jarring how fast paced this book was at times, but it made for an intense read. Even though there was action around every bend in this story, which was a little much at times. I love fast paced books, but at times, the action seemed unbelievable. It was hard for me to believe there was that much action going on basically 24/7. I am grateful that the author added some nail bitting action, but I would have liked it to have been a little less dramatic. Everything about this book was fast paced, including the romance. I had a very hard time believing the speed at which the romance progressed. The romance in this book was a perfect example of insta-love. 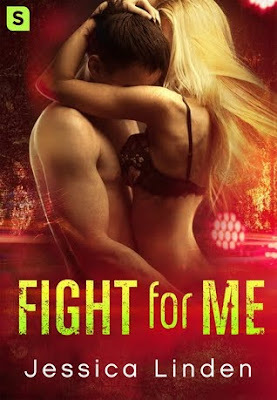 It felt very rushed and I could not believe their "love" connection at all.However, the author did a great job at creating the chemistry between the couple, Knox and Natalie. I could feel the passion they shared, even if the relationship itself didn't feel 100% believable. Natalie was a feisty character that I really enjoyed. At first, I wasn't sure if I was going to like her character. However, the author did a great job at developing her character. Natalie was a fierce and independent. I thought she was an awesome main character! Give me more Natalie! Overall, I thought this book was action packed and thrilling. Even though I did have some issues with this book, I thought it was an entertaining story as a whole. I would recommend this to people who are looking for a quick and exciting read. I am looking forward to seeing what this author will come out with next, because I can tell she has a lot of potential!